Hi guys, just got my hands on a Mk2 caddy van. Just as a a daily through the up comming winter. I know that its sort of based on the mk4 polo (dash, engines etc) But how many of the bits are the same? And, Will the front seats from a 16v Polo fot the runners in my caddy? as i have spares for that too! ANY ADVICE WOULD BE GREAT? Ill start a proper build thread with pics soon, once i get going! EDIT: Also, i have a mk2 polo S Steering wheel.... Are the splines the same size, anyone know? I though these were based on the Ibiza/Polo variant? the bumper wont fit mate, the caddy is wider than a polo, Ibiza or cordoba bumpers may fit? and I don't have a clue on the steering wheel sorry. 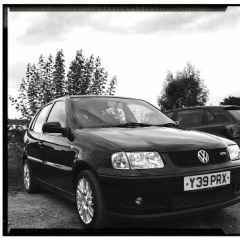 My caddy bumper is a bit ropey, And i have a fresh SMOOOOTHED mk4 polo bumper in the shed. yes these are based on the polo 6n variant/ibiza rather than the 6n hatchback. Most bits are the same except the front end is longer so things like the bumper from a 6n hatch wont fit. They are ideal for putting a tall block engine out of an ibiza into and better suited for other conversions such as 20vt than a 6n hatch as you've got more room in the engine bay to play with. Think i MIGHT look into putting something like a 1.6 petrol 8v into it sometime in the spring. Steering wheel wise, the mk2 one i have fits mk3s. And my old momo from a mk4 fit my corrado, are they not all just large spline, or small spline? or is that wrong? My polo gti 6n2 2001, is getting a refresh of new seats and steering wheel. I’ve recently got a mk2 caddy pickup. Can anyone tell me what will be a direct fit into the caddy from the 6n2 polo? Not a huge amount to be fair, the Mk2 Caddy pickup is a rebadged Skoda Felicia, which in turn was a reskin of the Skoda Favorit. Which engine has it got in? The 1.6 and 1.9D were a VW engine, so there's a possibility of putting other engines in. mk4 polo seats slot straight in. Along with SEAT Ibiza and Córdoba andddd polo mk5. its the 1.9 diesel. Was contemplating a newer turbo Diesel engine. Or if I’m feeling extra ambitious a 1.8t Audi TT engine! I’ve read these fit ok. Also a vr6 from a mk 3. But finding a decent one is getting hard. The engine bays are very very tight, to the extent that the diesels have a smaller heater box so it all fits. 1.8t's have been done, there's a couple of build threads on briskoda, but it is a massive task. The benefit is they weigh nothing, so a little bit of power goes a long way.